Our DMV Test Cheat Sheet can help you pass your written exam - regardless of where you live or what type of license you're trying to get - on your FIRST ATTEMPT. Whether you are planning on getting your learner's permit, driver's license, motorcycle license, or even a commercial driver's license (CDL), we can help. Our DMV test cheat sheet is a convenient, easy-to-read, comprehensive, quick-reference guide that you can use to breeze through your test with ease. You no longer have to worry or stress out about not passing your test - just "cheat" your way through it! It's actually quite simple. Once you purchase a DMV Test Cheat Sheet, you can access it at any time on a smartphone or tablet device by logging into our website. Once you've logged in, you can view the cheat sheet of your choice and use it for reference notes during your exam (it's also a great practice guide, as it includes all of the information that you need to pass your test in one, easy-to-use format). 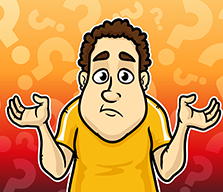 Stuck on a certain question? Can't decide between answers A and B? The answers are never more than a quick glance away with our DMV Test Cheat Sheet! But Isn't Cheating, Well, Cheating? In this case, not quite. Our cheat sheets don't actually provide you with your test answers. Rather, they provide you with the information that you need to pass. Think of it as being able to use your notes when taking a quiz or exam in school. Though our cheat sheets are a tremendous tool to have when taking your test, it doesn't hurt to practice beforehand. This is why we are happy to offer DMV sample tests in addition to our cheat sheets. As the old saying goes, "practice makes perfect." These practice exams can give you a good idea of the flow of the exams, what types of questions you can expect, and how long it may take you to finish them. 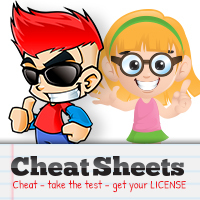 It also provides a great opportunity to cross reference the questions on the test with our DMV Test Cheat Sheet, so you can find the info you're looking for, quickly. If you want to prepare fully for your exam, then our DMV sample tests are for you. Getting a Class C license? Pass your written test with ease. Going for a Class M license? Don't risk failing - pass your FIRST TIME. Thinking of starting a new career or want money for college? Let us help. Need assistance? We're here to help in any way possible! 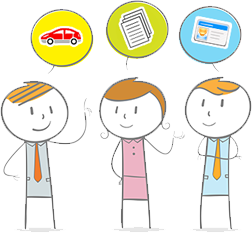 If you have questions or are unclear on how our Cheat Sheets work, contact us today or ask us on Facebook!